Pearl cockatiel is identified through its pearl markings which are usually found in its back, nape and wings. They have scallop-like feathers and they have established the third mutation of the cockatiel species. It is significant to note that the pearl in their body is the effect of their feather pattern changes not a color change. The pearl cockatiel has many nicknames such as the pearled cockatiel , laced cockatiel, pearly tiels, pearly cockatiel, pearl tiels and opaline cockatiel. The part of their body wherein the wings, nape and back feathers are edged or laced with the yellow or white color is known as pearling. While there are deeply pearled birds, there are lightly pearled ones as well. Male species of the pearl cockatiel do not lose this pearling though it can faint for some time and that only the heavily pearled ones are seen with the markings for long. Conversely, the female cockatiels do not lose these markings throughout their life. Pearling patterns vary from small to big patterns. Yellow cockatiels can look like cinnamon mutations with tannish brown coloring rather than gray or black. They are sometimes called Golden Pearls. Pearl cockatiel mutations can extend to 30 centimeters tall. Wild cockatiels travel in flocks, thus influencing their behavior during captivity. This communal 'flock' nature makes them suitable as pets. They can adapt readily breed and adapt to changes. What's good about them is that they may be left by themselves for long, provided that they are properly nourished. They do not have loud noise, thus you will not complain about that. Pearl cockatiel, just like other cockatiel species, loves to climb perches and play inside its cage. Thus, it would be very best for you to provide them with perches and various toys to enhance these habits and practices. Additionally, let them spend some time away from their cage if you have the chance to do so. Aside from that, cockatiels whistle and imitate speech. This is most evident in male cockatiels. Telling whether a pearl cockatiel is male or female could be hard until the males lose their pearl complexion after some time. Female cockatiels never lose this coloration, thus this could be your significant indicator. From their initial molt, males lose their markings and return to gray after several years. The truth is, males never lose markings. It is just that their markings turn pale that they become unseen. By Sara Looper - Sara Looper is a cockatiels expert. 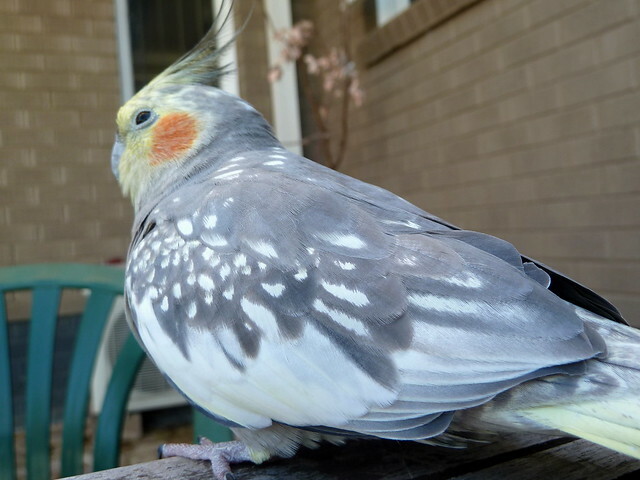 Unlike other mutations of cockatiels that have been achieved over the years, the pearl cockatiels are not really a color mutation, but rather a change of feather pattern. This very lovely feather pattern when combined with various color mutations results in some outstandingly, beautiful cockatiels. Various cockatiel mutations have been achieved through the years by very careful selective breeding. Most bird owners now think that the normal grey cockatiel is pretty boring. There are trade offs, however. The more the mutation from the normal grey, the less intelligent and ditzy the bird seems to get. Our three cockatiels who are mutations are much more flighty, more easily scared and have more night frights than our two normal greys. Pearl cockatiel varieties include the lutino pearl cockatiel which has the yellow lutino coloration with the pearl feather pattern. Lutino pearls retain the orange cheek patch. The cinnamon pearled cockatiel has the cinnamon mutation with the pearl feather pattern which results in a very pretty bird. The pied pearl cockatiel as well has the pied coloration with pearl feather pattern. The pastel pearl cockatiel, which we have, does not have the orange cheek patch. An important thing to know if you are looking to purchase a pearl cockatiel is that only the female pearl will retain the full pearl feather pattern for life after the first molt or later in the second year. Male pearls plumage will usually fade to the point of looking like a normal grey. In rare occasions will it stay. His coloring will be somewhat like the normal grey, but his wing feathers will have two shades of grey coloring, which has an attractive pattern. The orange and yellow areas will be less intense than the normal grey. In the hen pearls, the general body color is similar to that of the male with the ear patches not being so intense. The wing bars are less pure in color. There is no white on the crown and the yellow areas are even fainter. The thighs have barred yellow and the underside of the tail is striped and dappled with gray and yellow. So if you want a pearl cockatiel, the best bet is to purchase an older pearl cockatiel who has molted or is around two years old to assure that you will keep the pearl color. Or you can play the odds. We got lucky and bought our female pearl as a newly weaned baby. To our delight, she turned out to be female and is very beautiful. She gets lots of compliments from our friends. Shari Hickman is a bird lover with over 25 years experience raising cockatiels, finches and parakeets.